Laboratory Design & Construction is proud to represent Labconco’s extensive, high-quality line of biological safety cabinets. If your lab is handling any bio-hazardous materials including blood, urine, potentially harmful cell lines and tissue work, we can provide the safety you need. Biosafety cabinets can also protect your in-process samples and final products from cross-contamination and are a vital piece of equipment for any cell culture lab. Class II, Type A2 – Designed to protect the user, environment and product from exposure or cross-contamination, Class II, Type A2 enclosures recirculates 70% of the HEPA-filtered air while the remaining 30% passes through an exhaust HEPA filter to be discharged back into the laboratory or an optional canopy. Class II, Type B2 – Suitable for product, user and environmental protection, these biosafety cabinets use a hard-ducted, total exhaust system with 100% of the HEPA-filtered air deposited outside of the building. 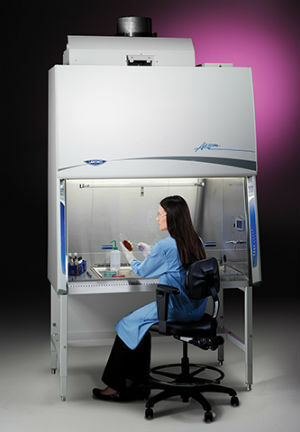 Class II, Type C1 – This type of biosafety cabinet has the ability to switch between A2 and B2 modes. Class I – Exhaust HEPA filters protect the users and environment from materials requiring Biosafety Levels 1, 2 and 3. Class I enclosures do not protect in-process samples or product. Cell Logic+ Biosafety Cabinets – These biosafety cabinets are thoughtfully designed specifically for a cell research lab. Contact us today to discuss your biosafety cabinet requirements.